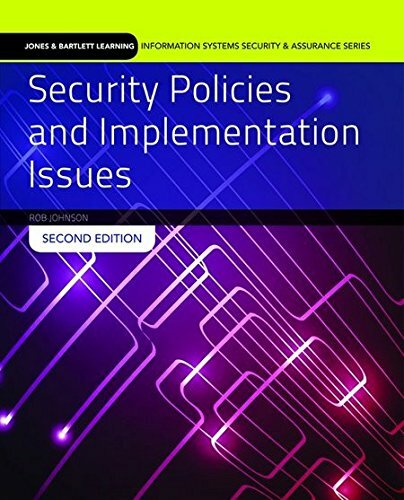 Security Policies and Implementation Issues, Second Edition offers a comprehensive, end-to-end view of information security policies and frameworks from the raw organizational mechanics of building to the psychology of implementation. Written by an industry expert, it presents an effective balance between technical knowledge and soft skills, and introduces many different concepts of information security in clear simple terms such as governance, regulator mandates, business drivers, legal considerations, and much more. With step-by-step examples and real-world exercises, this book is a must-have resource for students, security officers, auditors, and risk leaders looking to fully understand the process of implementing successful sets of security policies and frameworks. This book is part of the Information Systems Security and Assurance Series from Jones and Bartlett Learning. Designed for courses and curriculums in IT Security, Cybersecurity, Information Assurance, and Information Systems Security, this series features a comprehensive, consistent treatment of the most current thinking and trends in this critical subject area. These titles deliver fundamental information-security principles packed with real-world applications and examples. Authored by Certified Information Systems Security Professionals (CISSPs), they deliver comprehensive information on all aspects of information security. Reviewed word for word by leading technical experts in the field, these books are not just current, but forward-thinking–putting you in the position to solve the cybersecurity challenges not just of today, but of tomorrow, as well.